This was a difficult pattern, indeed! My first attempt came to a rapid end when I realised I had gone backwards and could go no further. This second attempt I did manage to go all the way round, but the centre is a right mess! I definately need to try again, with a clearer thought about how to do the middle. 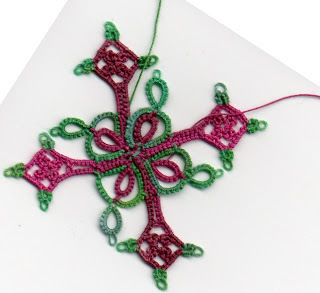 I am grateful to Fox and Tatting Fool, who had already gone before, because it reassured me to see that I wasn't the only tatter to get into difficulty with this pattern. The scanner is the one at work, and I have a few problems with that, too. I really like the threads you have chosen here... This is excellent for your first go-around. You should have seen my little pile of cut threads! I can see (because of my horrific problems with the pattern!) where you had the same issues as I did! Yes, it is reassuring to know that other do not find this pattern a breeze!